Srinagar: The J&K government has decided to link the salaries of its employees with their social media “inactivity” to strengthen its new social media policy. Employees will now have to get a No Objection Certificate from respective disbursing officers about their Facebook and Twitter activity before their salaries can be drawn, Finance Minister Haseeb Drabu said today. “The Drawing and Disbursing Officers will determine if the employee’ activity or inactivity has been in line with government policy. Only then the salaries will be disbursed,” Drabu said, calling the step as a major digital leap under the pay and accounts system. The government has also decided to seek non-involvement certificate (NIC) on social media from new candidates applying for government jobs. A notification issued by General Administration Department (GAD) has asked state’s recruitment agencies including Services Selection Board (SSB) and Public Service Commission (PSC) to seek NICs from the applicants. “The applicants have to submit the NIC certifying that he/she doesn’t have a twitter or facebook account in his/her name and that they don’t use any other social media to highlight their views,” Simrandeep Singh, chairman SSB told Dapaan. According to GAD notification, state’s police department would be authorised to issue the NIC. Defending the move Drabu said the move amounts at “nipping the evil in the bud”. 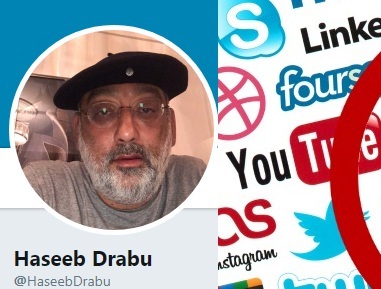 Drabu said the government was in talks with Indian Home Ministry to prevail upon social media giants like Twitter and Facebook to open up counters in Srinagar and Jammu to issue NIC to the aspiring candidates. Meanwhile, PDP has hailed the government’s efforts of making NIC mandatory for the government job seekers.